Wheat in southern Wisconsin is still very early in development. At last scouting many varieties were looking good and responding well to warmer temperatures and frequent rain. As I mentioned in my April 24th update (https://ipcm.wisc.edu/blog/2013/04/wisconsin-winter-wheat-disease-update-april-24-2013/), Septoria leaf blotch was present at low levels in several cultivars in the variety trial at the Arlington Agricultural Research Station. Septoria is still active in these plots and increasing slowly on susceptible cultivars. Reports of stripe rust have been prevalent in southern states this season. Many states in the deep-south and transition zone have reported low to moderate incidence of stripe rust. Reports have been slowly moving north. This week, Dr. Stephen Wegulo, Extension Plant Pathologist at the University of Nebraska reported stripe rust on wheat at the 3rd or 4th leaf stage in Mead, Nebraska (Fig. 1). This is extremely early to see stripe rust and can severely impact yield if found at this stage. Dr. Wegulo reported very high incidence and moderate severity on susceptible varieties. Furthermore, this report is at a latitude that is getting closer to that of southern Wisconsin. While I haven’t seen any stripe rust this season in Wisconsin, it wouldn’t hurt to begin to keep your eyes peeled for rust if you are planning herbicide treatments on wheat in the next couple of weeks. Also, don’t forget to scout for powdery mildew at this stage too. I haven’t seen any powdery mildew, but look for it while performing any maintenance spraying. 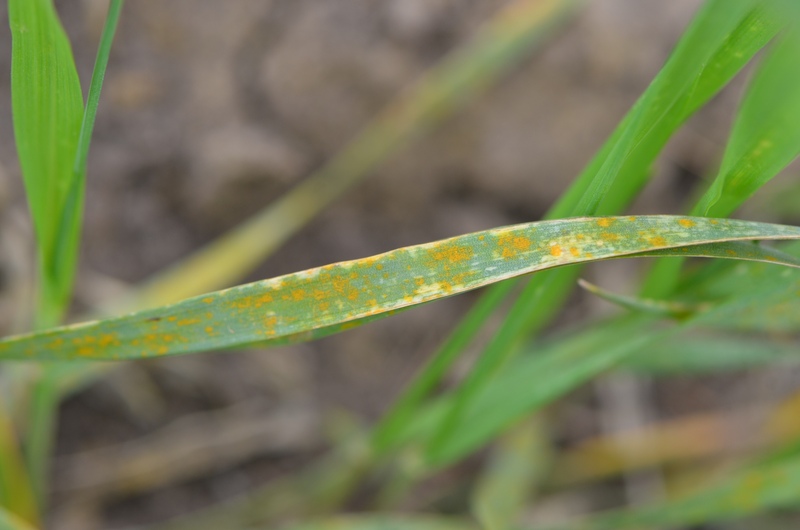 For more information about rusts, and stripe rust in particular, check out my previous articles located at https://ipcm.wisc.edu/blog/2013/04/wheat-scouting-and-little-more-about-rusts/ and also at https://ipcm.wisc.edu/blog/2013/03/using-fungicides-on-wheat/. Figure 1. Close-up of stripe rust on a young wheat plant near Mead, NE. Photo Credit: Stephen Wegulo, University of Nebraska.